Ready to Rock. And Rock We Did. Rev3′s Epic provided my teammates and I our first outing together this season. Our contingent consists of Michelle Faucher, Aaron Bernard, Bryce Read, and myself. Our goal was to work out team dynamics in preparation for the Untamed New England 4-day Adventure Race taking place in Maine this June. Epic also helped prepare me for a string of 24-plus-hour races on the calendar for the summer. Michelle served as primary navigator with myself, Aaron, and Bryce playing mixed support roles. This race was Rev3′s 2nd Epic race. 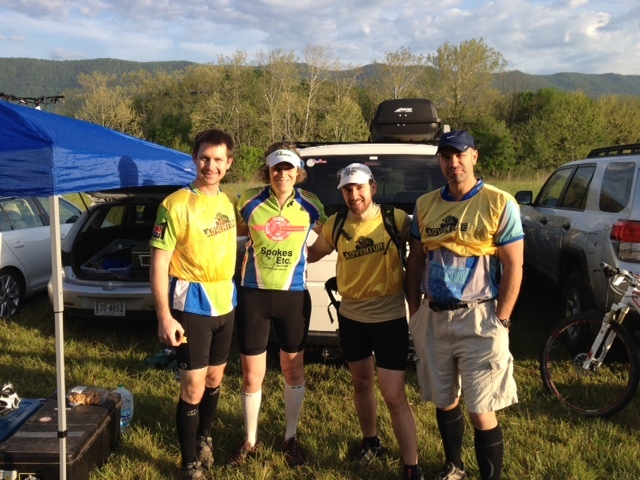 Some of the best adventure racing teams in the nation arrived at the starting line at 9:30 AM and set off for the next 26-hours of trekking (30 miles), biking (60 miles), paddling (12 miles), and one challenge. The challenge consisted of attaching ourselves to a rope with zip ties and going up, over, and through a series of picnic tables one teammate at a time. By the 12 PM finish the following day, we had a pretty good grasp of Andy Guest State Park, the George Washington National Forest and areas surrounding Luray and Front Royal, Virginia. The lowest point of the race for me was climbing down a rock outcropping around 2 a.m. and falling onto my left hand. At the time, I didn’t realize why it was so painful. A few days later I discovered that I had broken it. When it happened, I just sucked it up and kept moving to the finish line. I forgot all about the pain while experiencing my highest points of the race, and there were two: a) learning, at the finish line, that we had at a minimum secured a top five finish in our division, and b) collectively realizing that our team meshed really well and had a great time because of it. The lowest point for the team were 4 mechanicals during the bike sections. More specifically, two broken chains and derailleur issues. We quickly fixed the mechanical issues due to everyone on the team either having the right parts or the expertise to fix the bikes. Once fixed we were able to make the time up because no one dwelled on it. We just kept our heads up and pedaled hard through the sections. The mechanicals were totally forgotten as we flew down the backside of Veach Gap knowing we were close to the end after a hard slog. The moment that stays with me from the race is passing a team on the paddle that was in the water with their canoe and all their gear sinking right in front of them. The looks on their faces were of dread and great memories all rolled into one. Epic is one of the first local 24-hour races of the season and is a great way to get ready for the rest of the season. I will definitely try to add this race to my calendar next season, as I thought it was well put together and had excellent mountain biking, trekking, and paddling through one of the best parks in the area. Big shout outs the Rev3 staff for putting together a great race. Word up to Andy Bacon, Charlie Roberts, Mark Latanzi, and Jen Moos of Odyssey/ImOnPoint for pushing the pace of the race. Also a big shout out to Shane Hagerman for keeping moral high and taking great pictures! Finally to Spokes, Etc. for sponsoring us which allows us to do what we enjoy – adventure racing. Don’t trust a chain with a link down after a grueling 13-hour mountain biking race the weekend before. My bike now has a new chain. The more real food I eat in the latter part of the race the better I feel. I realized I wanted to eat everything Bryce was carrying because it didn’t look like a power bar. So, this race I packed plenty of real food consisting of pizza and salami, ham, and cheese wraps, and the occasional cliff bar. Nutrition bars become intolerable and hard to get down. I will still carry some bars and gels due to their big calories and small size, but will rely more on real food throughout my races. Putting large amounts of time in the saddle training pays big dividends in the middle of the night climbing a 2 plus mile switch-back up a mountain after snagging an optional CP. Seems like a no brainer, but I’m very happy that I still had energy after the night mountain biking section. Teamwork is the main and most important part of adventure racing. I have had the pleasure of racing with other members of the team, but this was my first in the 4-person coed division and I quickly realized how team dynamics could make or break a race. I am happy to say we had a great dynamic and I am excited for the rest of our season together!